Each evening, nestled in Berlin’s Treptower Park, the immigrant circus comes to life. Ellie is passionate about the circus, Germany’s flagship integration project, and drawn to its broken people. Even so, if she wants to keep her job at the newspaper, she must head up a campaign against it. When Yusuf fled Syria, he lost everything. Now the circus, with its middle-eastern flair, is the only home he knows. When the lights go on, the refugees dazzle their audience, but off-stage they can’t escape the traumas of their past and the far-right radicals that dog their every move. One night, in the midst of a show, two young circus boys come to blows. The resulting violence shines a spotlight on the refugee estate and swells the tide of public opinion against the immigrant circus. As tensions rise and with the circus at risk of closure, Ellie must convince her readers that we can have compassion for those we fear, or Yusuf will be forced to uproot again. “In many ways, there is no better time for the appearance of Hidden Colours, with its themes of intolerance, repression, prejudice, and communities clashing with each other as they assimilate immigrant newcomers. The stage is ripe for this story of different perspectives, desires for safety and community, and the issues posed by immigrants who are viewed as threats, and Nillu Nasser does an exquisite job of reflecting this environment and the social and political forces at work among all groups. “Precarious situations are balancing acts in more ways than one and the underlying concerns of immigrant and German characters alike are deftly and clearly explored in a story that adds psychological and social depth to political dilemmas. “The result is an engrossing portrait of clashes between cultures, shared bonds and points of contention, and how Ellie and Yusuf reconcile their lives with the impact and influence of changing social situations. Steeped in the cultures and flavors of Berlin, it’s obvious that Nasser’s story contains a personal familiarity and affection for the city’s structure and peoples as well as many insights on xenophobia among and outside of immigrant groups. The issues surrounding refugee integration processes and descriptions of experiences and clashes of different cultures thrown together are astute, and result in new perspectives and challenges. The long journey faced by all isn’t just about arriving in a new place: it’s about making it home. 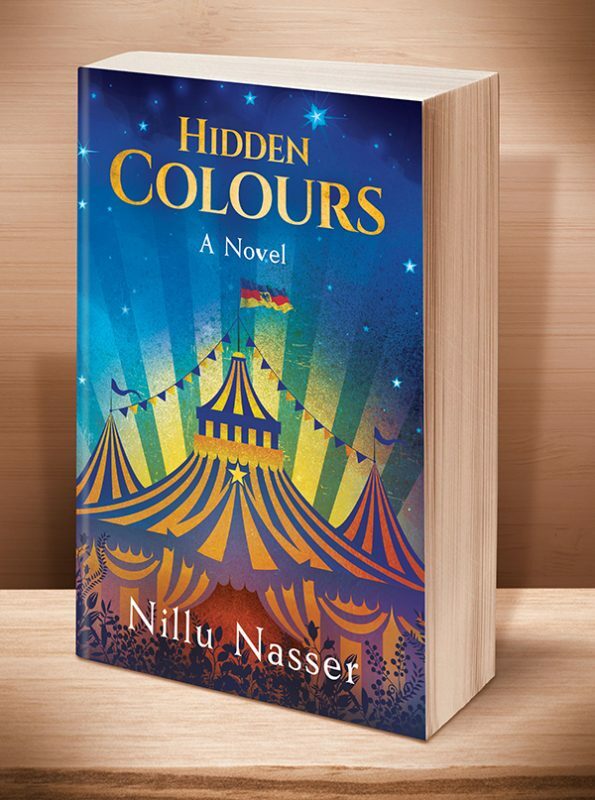 "Hidden Colours by Nillu Nasser is the breathtaking, emotionally raw and politically stimulating novel about a young refugee fighting to build a home in a strange land. I was taken along on a provocative, heartfelt journey from the first page to the striking conclusion. I needed to know how it ended for Yusuf, Ellie, Isaiah, Emir, and the rest of the refugees. The end stunned me, leaving me reverberating with unchecked emotion. The author managed to create a breathtaking and colorful story world all her own, with characters with which one can easily sympathize. Her themes lent extra depth, drawing in the reader, compelling them to hear her daring, yet peaceful message of compassion and hope. I would recommend this stimulating and exciting book to those that enjoy deep, reflective yet vivid reads. I would highly suggest this novel for a book club." "What I particularly enjoyed about Nillu Nasser’s work was that it has the high quality storytelling of a literary work but without the unnecessary length that so many of them have. In Hidden Colours, we stick close to the story and our central cast of wonderful performers and different nationalities, and though the tension of the outside world is prevalent, this is very much a tale of individual experience. Nasser brings characters to life with sharp dialogue, heartfelt atmospheric description, and some quite shocking violence which is painfully realistic to our time. Ellie and Yusuf really pave the way for an exciting future of heroes in fiction. Overall, Hidden Colours is a must-read for those who enjoy interpersonal drama and are also concerned with the cold, discriminatory hatred that’s seeping into our world." "Nasser eloquently explores racism, Islamophobia, and xenophobia through a narrative that's tender, haunting, and fearless. Yusuf is a particularly memorable character with a complex architecture of inner turmoil about his identity in this strange land and the traumatic losses that drove him from his homeland. The city of Berlin plays an intricate part of Hidden Colours as Nasser draws on its history to illuminate the irony and hypocrisy of political and cultural views threaded through this novel, while also painting a vivid portrait of the celebration of cultural diversity to offset the uglier side of the populace. The budding romance between Yusuf and Ellie felt a little contrived at times and didn’t quite work for me. However, Hidden Colours is an unforgettable tale of personal trauma and social justice." This entry was posted	on Wednesday, October 3rd, 2018 at 1:08 pm	and is filed under . You can follow any responses to this entry through the RSS 2.0 feed. Both comments and pings are currently closed.